While all Les Pauls share common design features, the Les Paul Custom distinguished itself from the Les Paul Standard and Les Paul Goldtop with a solid mahogany body. The Les Paul Custom PRO carries on that tradition but with the added twist of a maple veneer top, which adds a subtle “bite” to the Les Paul Custom’s legendary tone. Just like Les’ personal Custom, the Les Paul Custom PRO has a solid mahogany neck with a 24.75” scale that’s hand-fitted with a glued-in joint for optimum neck-to-body contact, which allows the Les Paul Custom PRO to resonate as one solid piece of wood. The fingerboard features pearloid block inlays and has a 12” radius, a 1.68” nut and 22 medium-jumbo frets. The mahogany neck has a very comfortable and super fast SlimTaper™ “D” profile, the most popular profile found on today’s Les Pauls. The Custom PRO also features beautiful 5-ply (white/black) binding around the maple veneer top and the back along with single-ply cream binding around the body. The ebony fingerboard is bound in white and the clipped dovewing headstock features 5-ply (white/black) binding along with a ’50s era/Custom-style “split diamond” pearloid inlay and, of course, a vintage “Epiphone” logo in pearloid. 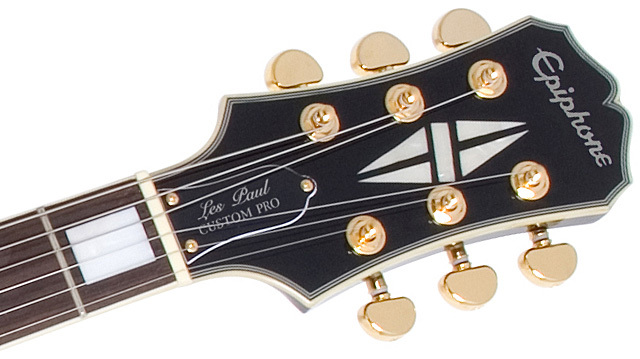 The Kalamazoo-era bell-shaped truss rod cover features “Les Paul Custom PRO” in white silkscreen in tribute to Les’ timeless design. The Les Paul Custom PRO comes in Alpine White and Ebony. The Les Paul Custom PRO now features Epiphone’s ProBucker™ pickups, a 4-wire design with coil-splitting inspired by Gibson’s legendary BurstBuckers™. ProBucker™ pickups recreate the sound of the original hand-wound “PAF” humbuckers made by Seth Lover at the Kalamazoo factory in the late ’50s. Epiphone ProBuckers™ feature all the same ingredients as original PAF and BurstBucker™ pickups, including Alnico II magnets,Elektrisola magnet wire, 18% nickel silver unit bases and covers, and pole screws, slugs and bobbins manufactured to Gibson’s original specifications. The result is a phenomenal pickup that, over time, will develop the subtle, one-of-a-kind characteristics that you can only get from vintage humbuckers. And best of all, those unique pickup characteristics will give your guitar a unique “voice.” No two vintage Les Pauls sound alike and ProBuckers™ give your Epiphone Les Paul Custom PRO a one-of-a-kind sound that will get better the more you play. So plan on playing your Les Paul Custom PRO a lot! The Les Paul Custom PRO includes a ProBucker™-2 humbucker in the neck position that is slightly overwound for greater definition at higher volumes. The bridge pickup is a ProBucker™-3 humbucker, which is also slightly overwound to give your solos a wide tonalrange. Each pickup features coil-splitting via a push/pull control at each pickup’s volume knob, which really gives the Les Paul Custom Pro the ability to be any guitar you can imagine. All volume and tone controls feature full-size 500K Ω potentiometers matched with Epiphone’s rugged, all-metal, 3-way toggle pickup selector switch for long-lasting performance. 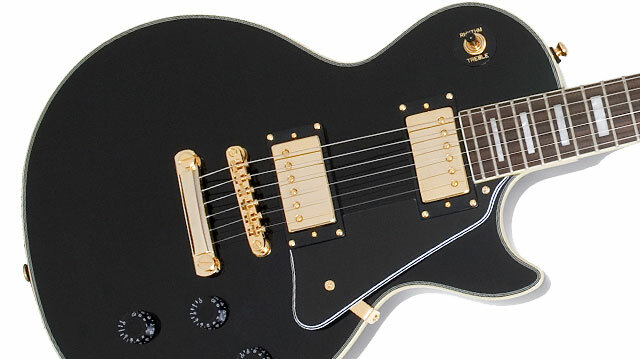 Epiphone’s reputation for great guitars extends to its unbeatable hardware and the Epiphone Les Paul Custom PRO delivers with a standard-setting gold LockTone™ Tune-o-matic bridge and a gold Stopbar tailpiece for superb tuningstability. 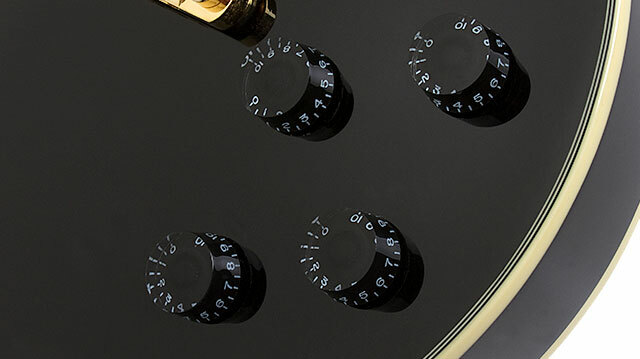 Both the Alpine White and Ebony models feature gold hardware, including gold Grover® machine heads with a 14:1 ratio. A hard case is optional.